The below list describes available Narratiive measures. Each web browser (or device) visiting a Narratiive tagged site is assigned a unique cookie ID. 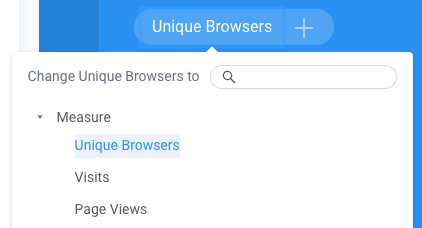 The unique browsers metric displays the number of browsers that visited a site during the selected reporting period. This metric displays the total visits (based on timed sessions) that occurred during the selected reporting period. A session ends after 30 minutes of inactivity and a new session commences with any future visit from the same device. A site's visits will generally report a higher number than unique browsers, because a browser may visit a site multiple times in the reporting period. This metric displays the number of pages viewed by all visitors to a site. A page view is counted each time a visitor clicks on a link, or refreshes the page, while visiting a site. This metric displays the average number of visitors to a site each day. It is calculated as the sum total of unique browsers from each day, divided by the number of days. This metric displays the average time a visitor spends browsing a site. It is calculated as the total duration of all visits to a site, divided by the number of visits. This metric displays the average time a visitor spends browsing a single page within a site. It is calculated as the total duration of all visits to a site, divided by the number of page views. This metric displays the average number of pages a visitor views whilst browsing a site. It is calculated as the total page views, divided by the number of visits. This metric displays how frequently an average visitor views a site. It may be used to infer visitor loyalty. It is calculated as the total visits, divided by unique browsers. Unique Visitor metrics have been discontinued in Narratiive. Unique Browsers replaces this metric.